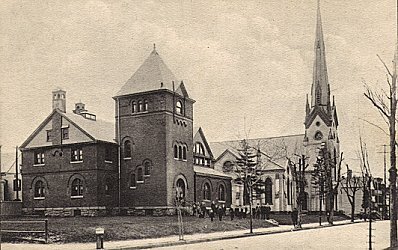 The Roseville Avenue Presbyterian Church was organized on April 9, 1854 with approximately 20 members. During the summer of 1852 a Sunday School was organized in a house standing on the northeast corner of Orange and Seventh Streets. Aaron Peck donated the land for the site of the church and the Sunday School moved to this site. In 1867 a new stone church was built and it was enlarged in 1875. Church gives relief to its own poor who are members, and to nonmembers with whom it is brought in contact in the course of church work. The West Presbyterian Church, though now independent, is still financially and otherwise aided by the mother church.